Brickhouse Music - Run by Musicians, For Musicians. Watch this link for announcements of May Sales! Hybrid Drumming - Including the amazing Roland Electronic Drum Modules, how and where to use them! Learn the basics of Music Theory and a whole world of music will open up to you! Theory is the all-important “basement” that we musicians build our “musical houses” on top of. Come to our Music theory sampler and we will share knowledge with you for FREE. 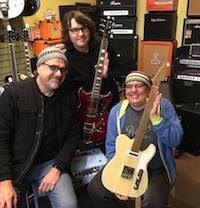 Brickhouse Music's Rock Band is an ongoing class that provides students with the opportunity to use the skills and knowledge that they have acquired through lessons and practice in an ensemble setting. Guided by an experienced teacher, students will learn how to be part of “a band” in an environment that is supportive, rewarding, and inspiring. The repertoire is chosen by students, and the band performs at the quarterly Student Showcase. Come hang with Walter and jam on your instrument. This jam session is free and open to anyone who wants to attend. Bring your banjo, uke, acoustic guitar, cajon, or any other instrument that's great for jamming. Register for one of our workshops or classes today! Your choice of Ernie Ball Paradigm or Martin Lifespan Acoustic guitar strings, a professional restring and cleaning of your acoustic guitar for only $20! Step-up acoustic guitars from Fender, Alvarez 15% off! Step-up electric guitars and basses from G&L, Fender, PRS and more 15-20% off! All Step-up Ukuleles an extra 15% off! Check out some of the other pedals we have in our online store! This is just a tiny sample of the pedals we have on hand - we stock MXR, Way Huge, Cry Baby, Moog, Dwarfcraft Devices, Electro Harmonix, Pigtronix, Tech 21, Sans Amp, Mooer, Henretta, Maxon, Z. Vex Effects and many more!